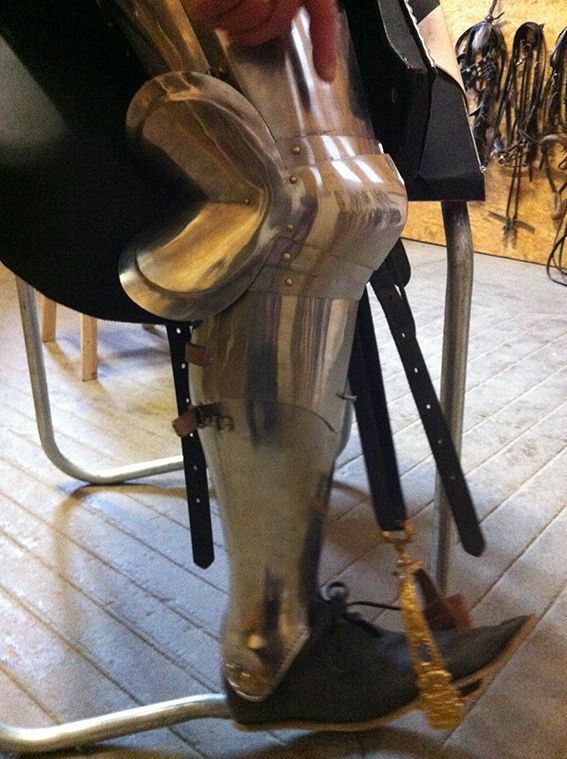 If you have any kind of used jousting equipment for sale or trade, please email me the information and pictures that you would like listed. 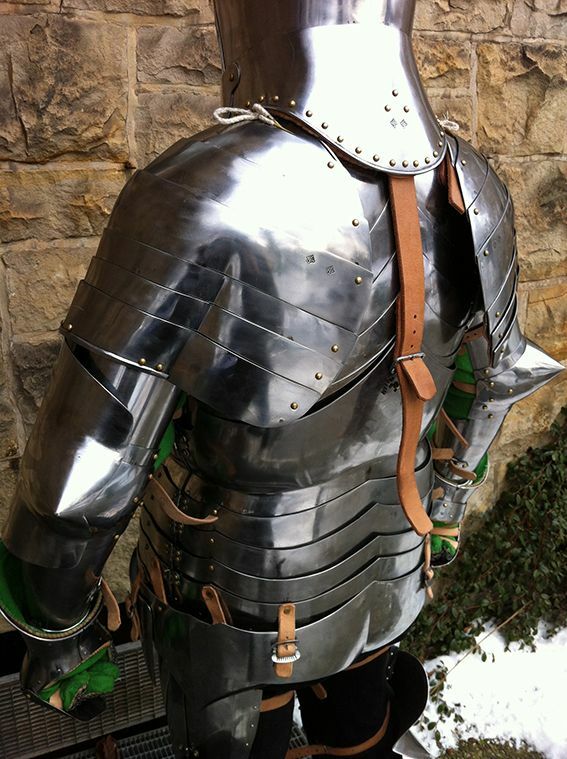 Set includes "Arming doublet+riveted chainmail gorget, sallet+bevor, cuirass+back plate+lance rest, spaulders, elbows, vambraces & gloves. 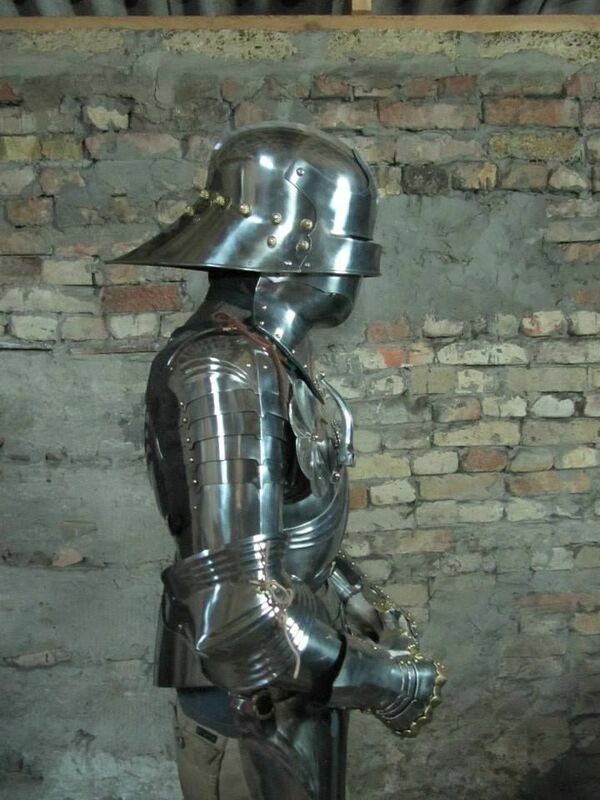 The size - chest - 100-105cm, waist - 75-80cm , for person 170-178 heigh, mild steel , high quality brass buckles, hinges & rivets, hand colored vegetable tanned leather dark blue." Currently located in Bückeburg, Germany. For more information, email Christin Krischke. 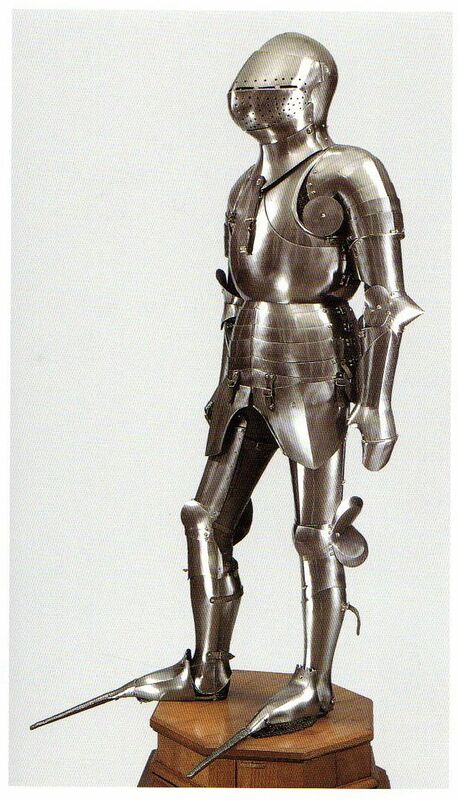 This armour was based on the Cuirass of Frederik of the Pfalz („the Victorious“, 1425 - 1476), which was originally made by Tomaso Missaglia 1450 in Milano. 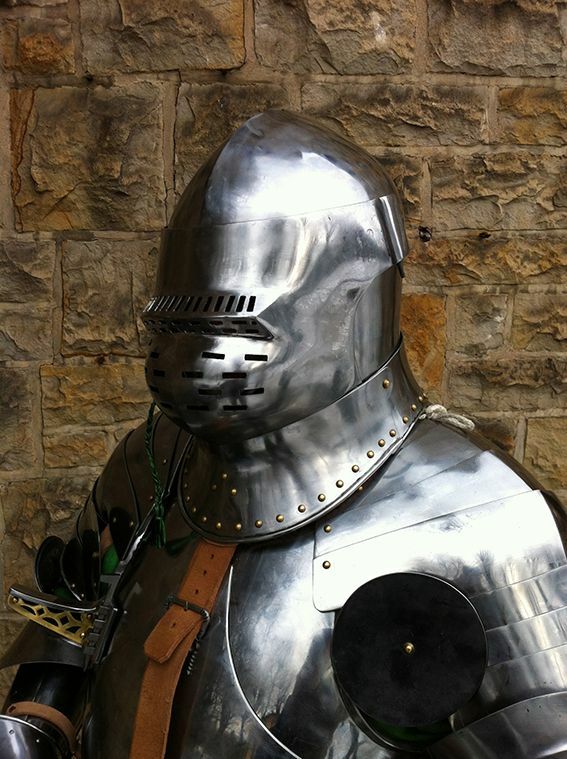 It was built „à la francaise“ (symmetric shoulders, small floating plates and enhanced armpits) with a great bascinet helm. 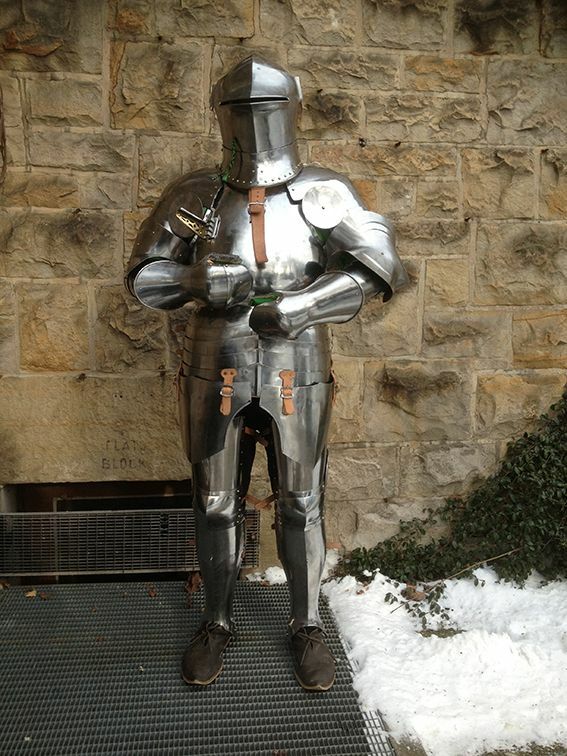 It was re-constructed by master-armorer Roman Tereshenko of the Ukraine for the tournament master, Wolfgang Krischke, to wear at "The Grand Tournament of Sankt Wendel" in 2012. 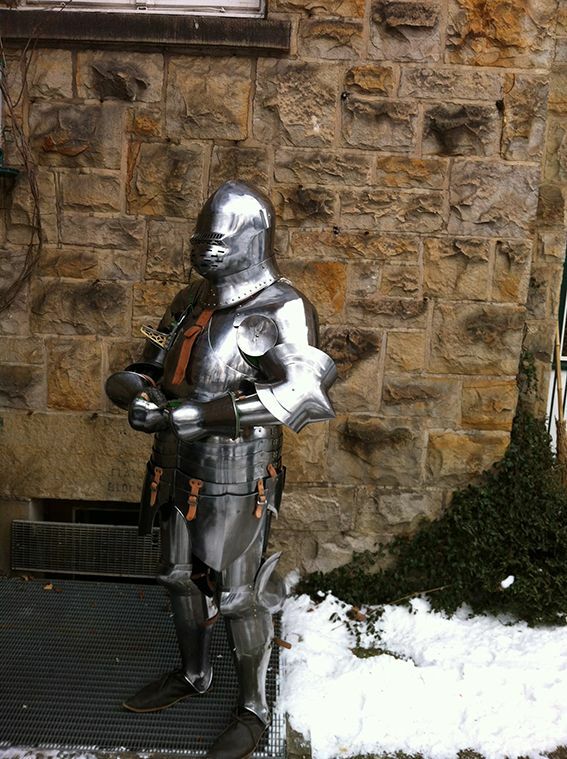 It was custom made to fit Master Krischke's 1.8 meter tall and 100kg frame. 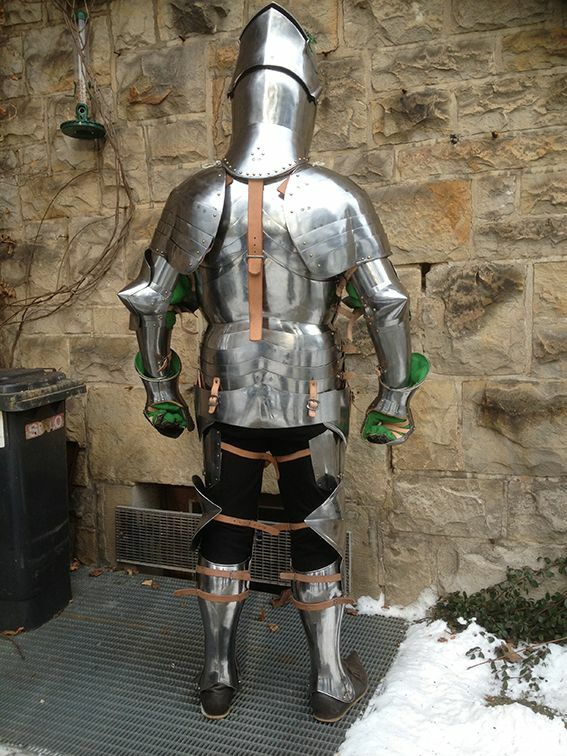 Authentic spring steel armor for full contact combat and solid lance jousting. 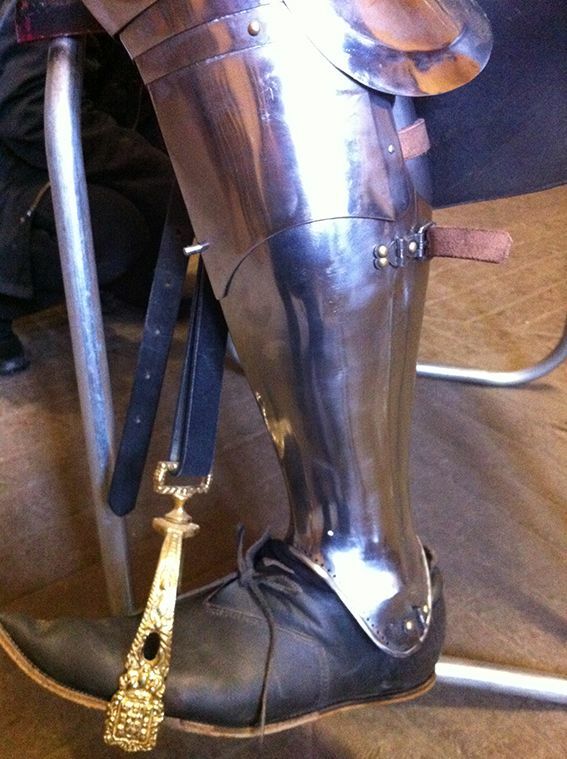 Extremely well crafted, perfect shiftings, solid leather parts, handmade buckles. Comes with the original, handsewn underclothing. 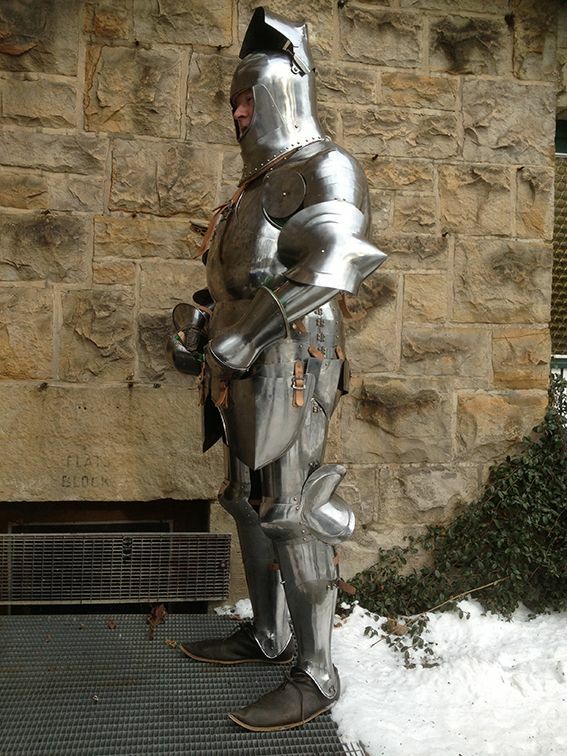 The helmet has 2 visors: the great bascinet and a jousting visor. 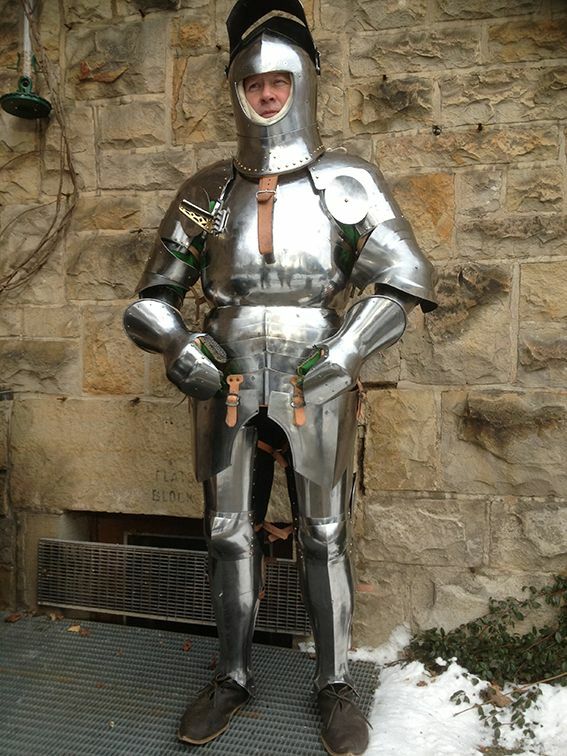 "This is a top quality joust armour. It is a high carbon alloy that has been professionally hardened and tempered. 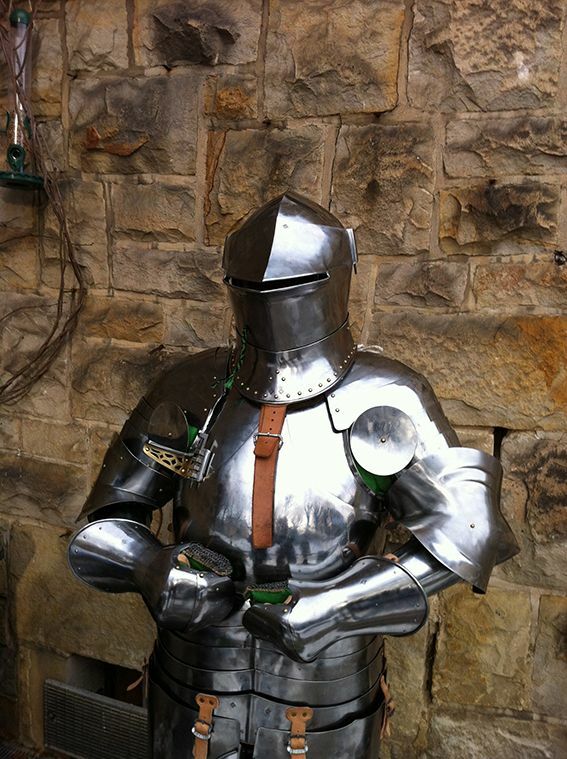 I have used this armour for historical jousting using solid tapered lances with steel coronels as well as US style heavy armour jousting and balsa jousting. It has been heat blued and has the usual wear marks but under the heat blueing is a mirror polish and it could easily be polished back to shiny. 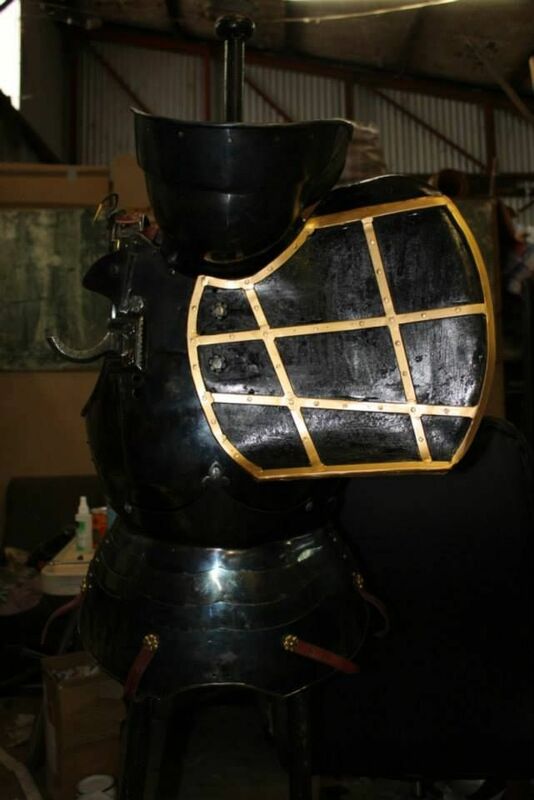 You get what is in the photos, the left and right arms, the breast and back plate and the tiltbuff and gridded grandguard. See the photos for descriptions. AUD$4500 + postage. I am not really sure I want to sell this so the price is fixed. I am a touch over 5'10" tall with a 35" waist and a 43" chest. It would fit someone slightly bigger or slightly smaller. 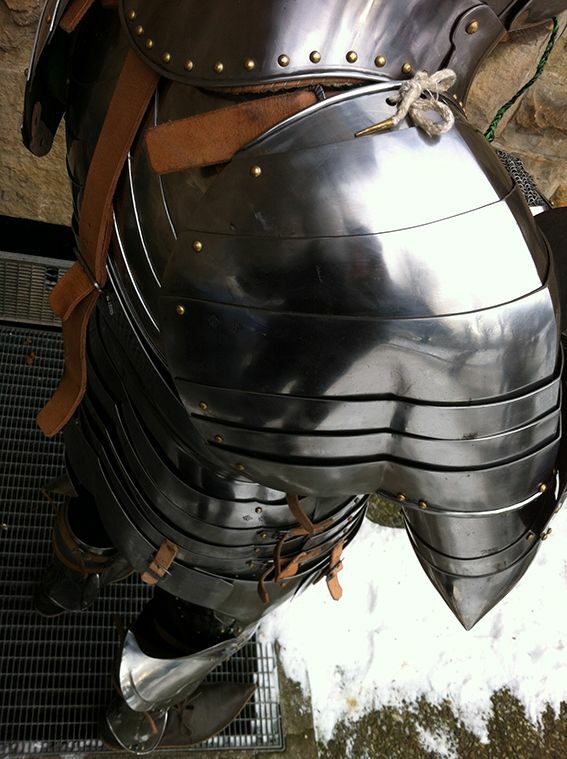 The weights for each piece are- Breast and Backplate together= 7.35kg/16.1lbs. Tiltbuff=1.75kg/3.7lbs. GG=3.65kg/8lbs. Left Arm=1.75kg/3.9lbs. Right Arm=2.25kg/4.9lbs. A rough idea of postage to the US- Air Mail=AUD$300. Express Post International= AUD$310. Express Courier International Merchandise=AUD$390. To add insurance to those postage costs is about another AUD$120."